Eggs Benedict – The best brunch dish you could ever hope to be served. What to drink? Bloody Mary’s, Kir Royal or Mimosas anyone? One of the classic sauces, Hollandaise is wonderful on steamed asparagus, most grilled or poached fish and is to die for when used for Eggs Benedict. Because I live in Sweden I don’t have the opportunity to just go out and buy English Muffins. I have to make them myself. I am not giving up my Eggs Benedict! Get the English Muffin recipe here! 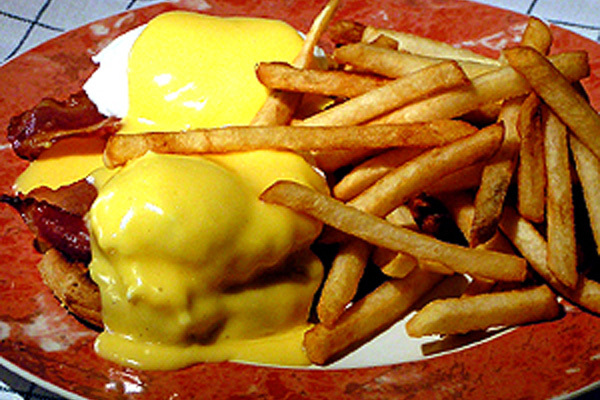 For a more detailed recipe for Hollandaise go here! English muffins are available frozen at The English Shop in Söderhallen in Stockholm. They also have shops in Örebro, Uppsala, Malmö and Göteborg. The best brunch dish you could ever hope to be served. What to drink? Bloody Mary's, Kir Royal or Mimosas anyone? One of the classic sauces, Hollandaise is wonderful on steamed asparagus, most grilled or poached fish and is to die for when used for Eggs Benedict. Get the English Muffin recipe here! Begin by taking everything you need out of the refrigerator and having it ready at room temperature. Clarify the butter by melting it and then pouring off all the fat, leaving the milky white part behind. In the bowl place the 3 egg yolks and place bowl over - not in the hot water in the pot. With a whisk, whisk the egg yolks until they become thick and sticky looking. This should take about 1 minute, (if your egg yolks were room temperature), then remove the bowl to the counter and whisk in the lemon juice and the cold water. Take a medium size frying pan and fry the smoked bacon until it done to your taste. Set aside and keep warm. While the eggs are poaching, split the English muffins with a fork and toast the top side. Butter the muffins and arrange 2 half's of the English muffins on each plate. On that place on piece of bacon. Drain the poached eggs every well using some paper towels to get rid of all the water. The eggs go on top of the bacon and then its just to spoon some of the Hollandaise sauce over the eggs. Get the English Muffin recipe! 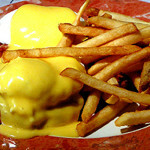 Eggs Benedict is usually served with thin crispy french fries but goes well with pan fried or crispy roasted potatoes. Asparagus is the best vegetable to go with this. If the sauce scrambles or curdles. If the sauce should scramble don't panic. Its a drag but you can fix it. Add the lemon juice and season to taste with salt and white pepper.